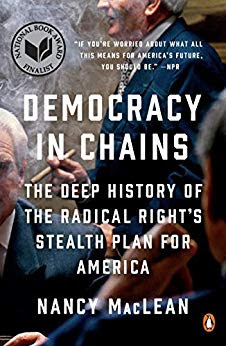 Jennifer Burns is biting in her review of Democracy in Chains: The Deep History of the Radical Right’s Stealth Plan for America by Nancy MacLean ---and justifiably so. for Buchanan, and MacLean strains to make the connection. assertion and suggestion rather than evidence. In the end, Democracy in Chains is characterized by a fundamental lack of curiosity. about American social or labor history. As such, it bears witness to an alarming parochialism. rather as testimony to its time.